In August 2017, Vietnam indicated it had bought BrahMos anti-ship cruise missiles, a weapon the country has long cherished, from India. Without being overly specific, the Vietnamese foreign ministry said “the procurement of defence equipment by Vietnam is consistent with the policy of peace and self-defence and is the normal practice in national defence.” India, however, claimed that the reports about the deal were “incorrect.” Nevertheless, there is no doubt that Hanoi is emerging as a pivotal state in India’s Act East policy. Indian Prime Minister Narendra Modi visited Vietnam in 2016, on his way to China for the G-20 summit. The visit, the first by an Indian prime minister in 15 years, made it clear that New Delhi was no longer hesitant to expand its presence in China’s periphery. The Modi government has made no secret of its desire to play a more assertive role in the Indo-Pacific region. Modi himself has argued that India can be an anchor for peace, prosperity, and stability in Asia and Africa. A more ambitious outreach to Vietnam, therefore, should not be surprising. Bilateral ties between India and Vietnam have strengthened in recent years with a shared focus on regional security issues and trade. Traditionally, India has had a favourable presence in Vietnam owing to its support for Vietnamese independence from France and eventual unification of the country, as well as for its opposition to the US involvement during the Vietnam War. Vietnam and India have a rich history of diplomatic relations. During the most testing times in its independence movement, India supported the North Vietnamese regime steadfastly. India was also one of the first countries to recognise the Vietnamese government once the consolidation of the country was achieved in the mid-1970s. Both Vietnam and India were also close allies of the Soviet Union during the Cold War. However, both countries have a strong penchant for underlining strategic autonomy in their foreign and domestic policies, which has often lead to friction with the US. With the rise of China in recent years, their ties have become strategic in orientation. Bilateral trade has also grown since the liberalisation of the Indian and Vietnamese economies. Vietnam has backed a more prominent role for India in the Association of Southeast Asian Nations (ASEAN) as well as India’s bid for a permanent membership in the United Nations (UN) Security Council. Mutual trust, threats emerging from a rising China, and a convergence of strategic interests have contributed to the deepening of ties between the two nations to the extent that Vietnam now engages India as a comprehensive strategic partner, a clear indication that both nations value this critical partnership. The institutionalisation of this bilateral partnership has been rapid. The two states promulgated a Joint Declaration on Comprehensive Cooperation in 2003 in which they envisaged creating an “Arc of Advantage and Prosperity” in Southeast Asia and initiated strategic dialogue since 2009. Through the Joint Declaration on Vietnam-India Strategic Partnership in 2007, India and Vietnam have agreed to establish strategic dialogue at vice-ministerial level in the Foreign Office. Five strategic dialogues have already been held: the first one in 2009, and the most recent in August 2016. The two nations have since 2007 also held annual defence policy dialogues, the 10th of which was held in Hanoi in March 2017. In 2015, the two signed a Joint Vision Statement for 2015-20 which commits them to regular defence exchange and interaction, defence trade, training, and cooperation in the development of new technologies thereafter. 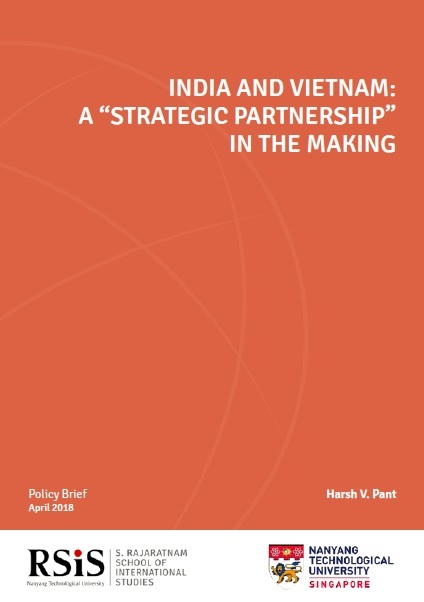 This report delineates recent trends in India’s relations with Vietnam with a focus on key factors driving this bilateral engagement. It argues that, spurred by underlying structural changes and strong commitment of political leadership in the two countries, India-Vietnam ties are likely to grow stronger in the coming years.